At first, I thought it was a gator. It was that big. I was walking around the north end of the lake just before dark. The shallow water there is dotted with tufts of grassy weeds and is clear enough to see straight to the bottom. It was a still evening. The lake mirrored the sky just the way I like and I was taking my time, admiring the view. Suddenly, I heard a loud splash and saw ripples in the water. My immediate reaction was to stop and gaze directly toward the spot in the water. The ripples receded, but moments later it happened again. Something large and white emerged from the lake -- not in a jumping motion but with a determined upward lift. Whatever it was had an agenda -- to reach a grassy tuft and pull a single blade down into the water. I've watched enough alligators in the lake to know there was something unquestionably nonreptilian about this creature's movements. If not a gator, then what, I wondered? An otter? A large turtle? No to both. It was a fish. A very large fish. After months of wondering where they've been hiding, I've finally found my triploid grass carp. And my, how they've grown! In May 2006, we stocked our 12-acre weed-clogged lake with 75 10- to 12-inch-long triploid grass carp. Grass carp are grazers whose diet consists entirely of aquatic plants. Triploid is just a fancy way of saying the carp are sterile. They can't reproduce and make more carp. We bought the fish from a hatchery in Center Hill after receiving a permit from the Florida Fish and Wildlife Conservation Commission. Our objective in stocking the lake with grass carp was to control the weeds. Choosing fish seemed like the most viable option. The other choices -- mechanical removal or chemical applications of herbicides -- just didn't fit our budget or lifestyle. Using triploid carp did, although the idea that weed-eating fish could possibly consume all the bladderwort floating about seemed highly implausible. Our doubts lingered as time passed and, while the weeds diminished substantially, the fish were nowhere in sight. "I don't understand why I never see them," I often lamented. "I'm on the water just about every day, but I never see any carp. The alligators, ospreys and otters couldn't possibly have eaten all of them up. So where are they?" Although the carp have managed to elude my observation during the past 17 months, they haven't ignored the lake's vegetation. Those babies can eat! And get big. The fish I observed were between 18 inches and 30 inches long. 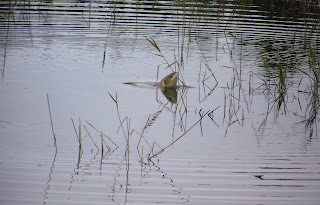 With their beady eyes, wide mouths, white underbellies and black-tipped tails, the carp reminded me of small sharks cruising the shallows in search of prey. In June, when I wrote about stocking our lake with triploid grass carp, some readers responded with words of caution. "I thought you would like to know," wrote Bud Simmons of Tavares, "grass-eating carp are not always the 'perfect solution.' "
In his e-mail, Simmons explained that about 25 years ago grass carp were added to Lake Fairview in Orlando to control weeds and grasses that were clogging that waterway. Within a couple years, the weeds were gone. All the weeds. "They cleaned the lake completely out," Simmons wrote. "The baby fish had nowhere to hide. Within five to six years the fish population in the lake crashed." According to Simmons, the lake eventually had to be poisoned to kill the carp then restocked and replanted with aquatic vegetation. At my small lake, we're almost a year-and-a-half into our fish-conquering-weeds project, so it's too early to tell if the Lake Fairview situation will be repeated. Ryan Hamm, a biological scientist with Florida Fish and Wildlife Conservation Commission, doesn't expect that to happen. "We're conservative with our approach when we permit stocking of triploid grass carp," Hamm says. "While it's true that grass carp are more of a wild card than an herbicide treatment, in most cases, they won't overgraze lake vegetation." So far, I'm delighted with the progress being made in our fish-versus-weeds experiment, but more time is needed to tell if my enthusiasm is justified. Meanwhile, my family can once again enjoy refreshing swims without becoming ensnarled in annoying weeds. As an unexpected benefit, we've also gained a new form of entertainment. We can sit on the bank and watch the antics of fish that look like sharks, eat like cattle and perform acrobatic movements like Baby Shamu. Triploid grass carp are a force to be reckoned with, and that's no fish tale. the triploid carp in our lake are doing great and are probably just about as big now as the ones in your golf course ponds, elliott. they are amazing fish. our lake has remained weed-free ever since we first put them in. in a couple more years we'll probably have to add others since the original fish only live for about 10 years. Are you still happy with your carp? Have you had to use herbicides, too? Did you have hydrilla in the lake when they were released? How do you feel about them now? Triploid carp have been in our lake for many years now and we couldn't be happier with the work they've done to eliminate the weeds that previously prevented us from swimming. We never had hydrilla and we never used herbicides. For us, triploid carp alone solved the problem. I would recommend them to anyone trying to reclaim weed-clogged water. Delta - the grass carp we put in our lake are sterile (triploid) so they cannot reproduce and potentially upset the balance of aquatic life. I don't know if the White Amurs are sterile but I suspect they are not and would therefore not recommend them for weed control. It would be illegal in FL where we live to add non-sterile grass carp to a lake. what do grass carp eat when there is no grass in my pond and the bank is exposed due to almost drought conditions?